fan letters and given out by him to fans at personal appearances. 20th Century-Fox’s television production unit was set to begin filming the series, and actress Anita Louise, whose husband Buddy Adler was a major studio executive at Fox, came out of retirement to play the mother. They had persuaded veteran actor Gene Evans to play the father, and respected character actor Frank Broeberg (a founder of the legendary Pasadena Playhouse) was picked to play the ranch hand, Gus. 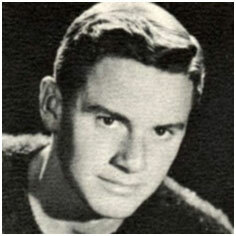 Johnny even had a family resemblance to Gene Evans, from his facial features to his chestnut hair. For several weeks before the series’ filming was to begin that summer, Johnny relates, he spent every day riding Flicka, with the thoroughbred’s trainer Les Hilton right along side them. Flicka (born Wahana) had been foaled in 1950, and was owned by Mr. Ralph McCutcheon. 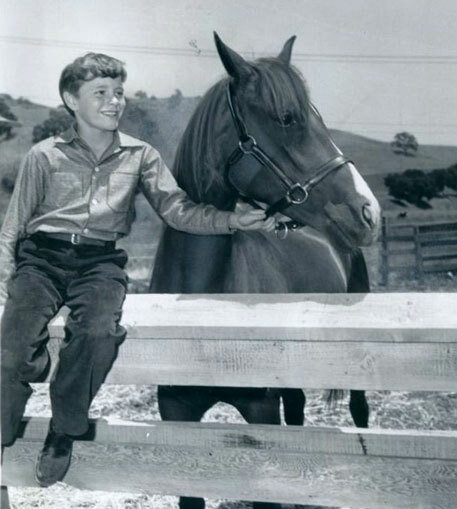 A close bond developed between Johnny and Flicka over the next two years of filming, and Johnny and his family found a new home in the San Fernando Valley. He had great fun working on the series, heartened by the camaraderie of series’ cast and crew. To feel his role more, he called Gene Evans “Dad” even off camera. He says that he recalls Evans once getting a kick out of spraying the crew with a water hose on an especially hot shooting day in Malibu Canyon, though he was careful not to hit the actors and spoil their makeup. Johnny's favorite pastimes while growing up were swimming and riding. Like all child actors, he was allowed to work only certain hours during the week in order to continue his education. Johnny says that at the time of theseries, 20th Century-Fox still had some of the original wardrobe from the 1943 motion picture, and he got to wear the shirt that Roddy McDowall wore as Ken when they shot the close-ups for one of the TV episodes. issue of TV Guide, alongside an article on the series. "With all the so-called adult Westerns launched on TV this season, a Western-styled adventure series slanted specifically at youngsters should come as a welcome relief--at least, to the kids. 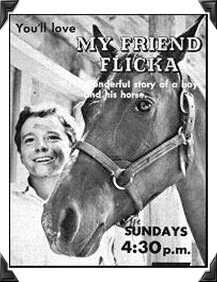 CBS' My Friend Flicka is just such a series. 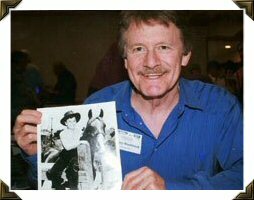 Based on Mary O'Hara's popular book, it is a better-than-average program about a young boy and his horse, Flicka, set in the Far West at the turn of the century. Flicka, an entry of Hollywood's 20th Century-Fox studios, boasts the finest quality in production, camera work and other technical attributes. The stories, though, too often tend to be downbeat. 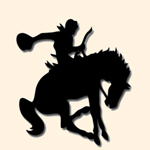 Flicka is stolen by a pair of baddies; Flicka is accidently shot and almost goes blind. The all end happily, but the show's viewers may be too young for such soap-opera themes. The writers aren't averse to pointing a moral now and then. The moral is usually sugar-coated enough to be taken in stride, as when the boy's father tells him, "You did what you thought was right, son, and that's the important thing." Star of the series is a beautiful brown horse (he looks black on TV), who almost knows as many tricks as Roy Rogers' famous Trigger, Gene Autry's pal Champion and the others. His pal is young Johnny Washbrook, who is just about what you'd expect in the role. Gene Evans and Anita Louise, as his mother and father, are sympathetic parents." “He originated the role of Renny in Mazo de la Roche's ‘The Mistress of Jalna’ at the Museum Theatre there, and played in summer stock, in addition to doing more than 200 television and radio shows, many of them over the Canadian Broadcasting Corp. network. Included among these shows are “Playbill,” the Ford Theatre show in Canada, the Canadian General Motors show and the Canadian General Electric program. His various directors and producers have said of him that “he is an ideal youngster in roles that require mature judgement”…”one of the most talented young actors in Canada.” He appeared with his brother Donald in “Life With Father” in summer stock and a part was even found for his mother, who played the maid. It was her first experience in the theatre. 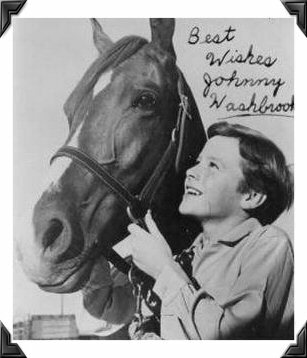 “I discovered during ‘Life With Father’ that Johnny was really meant to be an actor,” says Mrs. Washbrook. ‘One day the curtain went up and Johnny was missing. It turned out he’d had some trouble getting his coat on because it had been torn and, before he knew it, the curtain was up. After a couple of minutes, picking the right spot, Johnny just sauntered onto the set and sat down. The audience never knew he was late. I asked him later if he wasn’t frightened when he found the curtain up and himself in the wings, and he said, ‘No, I just figured the boy might be upstairs or something and might just come down after all the others were in the room.’ I thought if he had all that presence at that age, then there wasn’t much doubt about his being an actor.’ In April of 1955, Johnny was called to New York to do a ‘United States Steel Hour’ television show entitled ‘Roads to Home,” starring James Daly and Beatrice Straight. 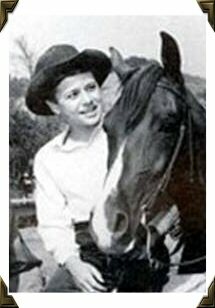 It was at this time that TCP was looking high and low for a youngster to play the part of Ken in ‘My Friend Flicka,’ based on the beloved Mary O’Hara book. One of the executives saw Johnny on the show and he was called to Hollywood to test for the part. He turned out to be so good he was also signed by 20th Century-Fox, which means he’ll probably also be acting in feature motion pictures before long. Johnny likes to swim and ride. He has taken ballet lessons in order to acquire poise, of which he already has a goodly amount, likes to tap dance and sings ‘a little.’ His favorite movie stars are Audie Murphy ‘when he does westerns,’ Randolph Scott and Roy Rogers. He has no favorite actresses, a condition which presumably will be remedied with age. 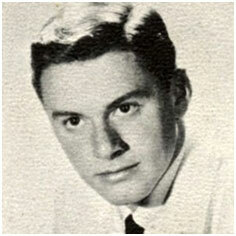 Up to the time he was signed for ‘Flicka,’ Johnny attended the Bedford Park School in Toronto. Now that he’ll be living and working in Hollywood, the entire Washbrook family is moving to the movie capital, and Johnny will be taking his lessons on the set from teachers furnished by the Los Angeles Board of Education. When he isn’t working he’ll attend the 20th Century-Fox school. At the age of 11, Johnny has few ambitions. He does say he wants to become a ‘good actor.’ Not just ‘an actor,’ but a ‘good actor.’ Nobody’s telling him, but he already has made the grade.” It lists his “vital statistics,” including his height at 4’ 5 ½”, weight of 70 lbs., red hair and brown eyes. It also stated that Colgate-Palmolive Company would be the sponsor for the series. 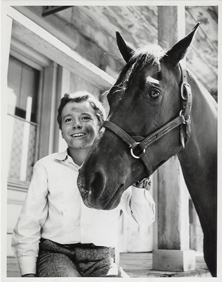 During the series’ run, both Johnny and his equally famous friend Flicka received tons of fan mail, and Johnny made many personal appearances throughout California to help publicize the show. Though his great popularity was evident, he had more of an impact on his fellow “war babies” than one his age could realize at the time. He touched the lives of millions of other kids, who related to this adventurous boy their age and were able to vicariously enjoy those exciting adventures of My Friend Flicka. A down-to-earth, healthy, family-oriented series typical of 1950’s television, each episode had something of a moral, and (naturally) a happy ending. 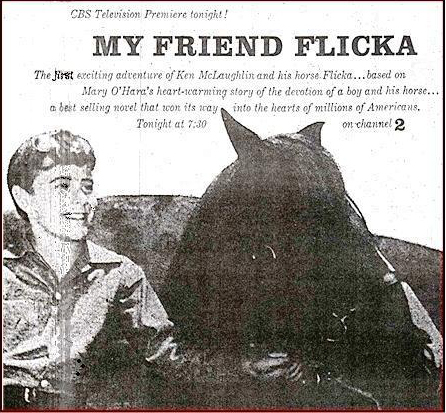 Flicka aired on CBS at 7:30 pm on Fridays, opposite ABC’s Rin Tin Tin series. My Friend Flicka was filmed at the Fox Movie Ranch in Malibu Canyon in Los Angeles County and on Fox Studios’ western street in Hollywood, with some episodes also filmed at the Iverson Movie Ranch in Los Angeles County. specially for this site as a tribute to old friends of the series, and new fans as well. The series ended--rather abruptly--with the departure of Anita Louise. 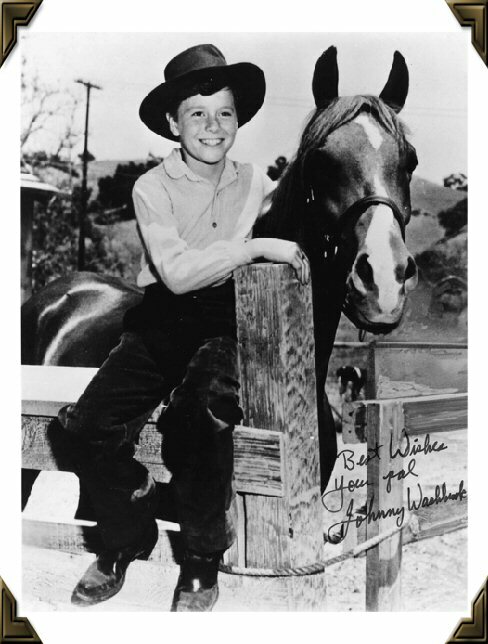 After his work on My Friend Flicka was finished, Johnny went on to work in a lot of television roles. Throughout his teen years, he had roles in TV series like Flipper, My Three Sons, The Donna Reed Show, The Millionaire, Hazel and on The Danny Kaye Show. In 1957, he played Tom Canty in an adaptation of Charles Dickens’ The Prince and the Pauper, aDuPont Show of the Month co-starring Rex Thompson, John Carradine, Patty Duke, Sir Cedric Harwicke, and Christopher Plummer. Carradine had earlier been in an episode of My Friend Flicka. 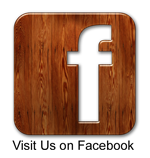 An NBC Color Television News press release was issued in New York City on October 28, 1957 with the title "'My Friend Flicka' Star Johnny Washbrook 'Just Another One of the Guys' at School." Johnny, who had just turned 13, had also just recently entered Junior High School. 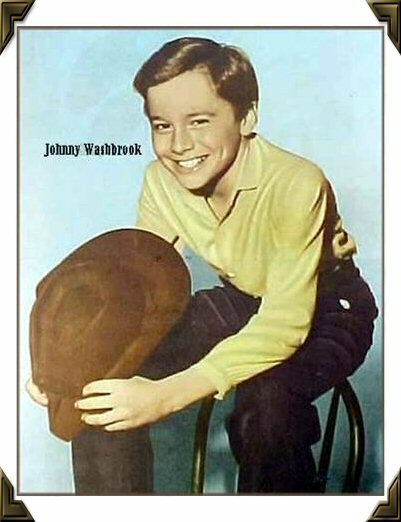 The release stated "Johnny Washbrook, who stars as adventure-loving Ken McLaughlin in NBC -TV's MY FRIEND FLICKA colorcast series, naturally wanted to be considered just 'another one of the guys' when he entered Van Nuys (Calif.) Junior High School this Fall. At first he was chided about the long hair he was growing for a forthcoming TV role. One heckler asked if he was a boy or a girl. 'A girl,' Johnny answered quickly. 'Do you want to take me out?' His unexpected reply won him that round. Later when asked before the class to tell about his Summer experiences, he was reluctant to mention his TV activities. He merely said he had suffered an illness while in New York." [He had been playing the role of Tom Canty in "The Prince and the Pauper" for the DuPont Show of the Month.] "At close of class, one of the former belligerents said: 'You're all right. You could have said a lot more!' Johnny knows now his fears were groundless. He has since been elected class president. MY FRIEND FLICKA is colorcast Sundays, 6:30-7 p.m., EST. NBC-New York, 10/28/57"
changed much in its more than 50 years of serving its community. The creator of this site had the opportunity in July of 2011 to talk a bit with Beverly Washburn, another former child star and a peer of Johhny's. She said still keeps in touch with Johnny. In the preface to her 2009 autobiography, Reel Tears; The Beverly Washburn Story, former child actor Lauren Chapin (Father Knows Best) tells how Beverly's home was a frequent gathering place for child actors. Social times, she relates, were rare for her due to her work schedule, and they were no less rare for Johnny and the other child actors--having to work and be schooled at the same time--and then there were the personal appearances that had to be made for publicity's sake to keep before the public in the news media. Beverly Washburn's mother was happy to often host parties for Beverly and her fellow child actors. "On any given night," states Chapin, "you might find Bobby Diamond (Fury), Sandy Descher (who played Bev's sister on The New Loretta Young Show), Steve Benson (a child actor whose mom also happened to be the casting director at Desilu Productions), Johnny Washbrook (My Friend Flicka), Paul Petersen (The Donna Reed Show), the kids from The Mickey Mouse Club, Johnny Crawford (The Rifleman), Barbara Parkins, Cindy Carol, Dirk and Dack Rambo, Randy Boone, Eddie Hodges, Steve Stevens, Tommy Kirk...the list goes on and on." 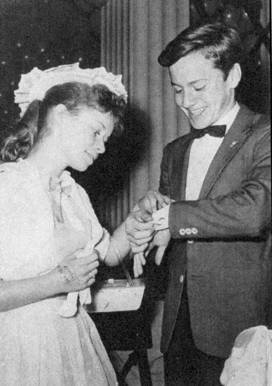 Johnny Washbrook with fellow child star Beverly Washburn at an Easter Brunch. "Gathering of Guns" in recent years, having appeared in TV westerns a great deal. 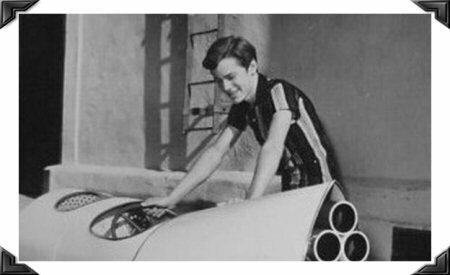 In 1958, Johnny had a role in the motion picture Space Children, co-starring child star Johnny Crawford (The Rifleman) and former child superstar Jackie Coogan (Charlie Chaplin’s The Kid). Also that year, he performed in another DuPont Show, with June Allyson, and appeared in the film Miss Lonelyhearts. A lobby card for The Space Children. The film starred not only child (now teen) star Johnny Washbrook (far right) but also--a bit down the list of credits--Johnny Crawford (2nd from left), who would begin co-starring in The Rifleman as Chuck Conners' son the same year. 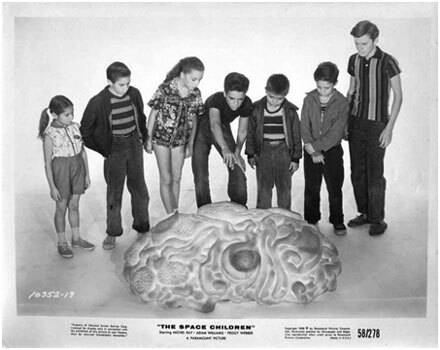 In The Space Children, a glowing brain-like creature arrives on a beach near a rocket test site, via a teleportation beam. The alien communicates telepathically with the children of scientists. The kids start doing the alien's bidding, with the adults trying to find out what is going on with all their unruly offspring. The film became somewhat of a cult classic in later years. 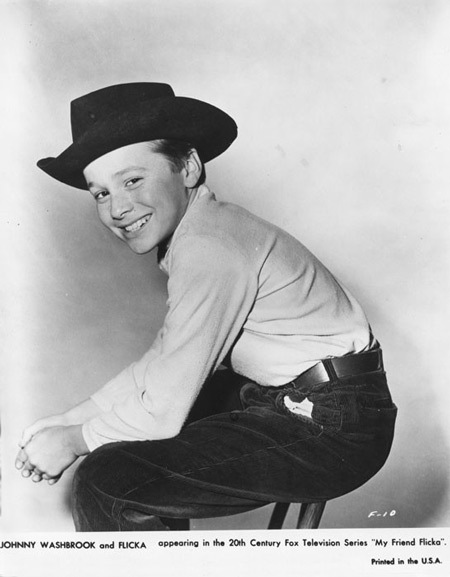 In 1959, Johnny had a role in the Lassie TV series, in an episode titled “Campout.” In it, he played a boy on the run from his family who encouraged younger boys Timmy (Jon Provost) and his pal Boomer to camp out by themselves, advising them to “beware of the bear.” He had a role in an episode of the short-lived series Outlaws in 1960, and appeared in two different episodes on TV’s Wagon Train—“The Swift Cloud Story” (1959) and “The Beth Pearson Story” (1961), with Virginia Grey. He portrayed character Tim Balfour in episode 191 of the Perry Mason TV series starring Raymond Burr, entitled “The Devious Delinquent,” which was broadcast on December 5, 1963. 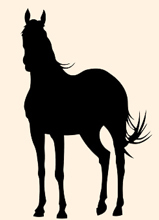 John had three brothers in all--Don, who was 3 years older than him; Mike, who was 6 years younger; and Rick, who was born after the Flicka series had ended, and was 13 years younger than Johnny. Brother Don had guest appearances in television series like Bonanza, Gidget and My Favorite Martian, and also a recurring role on the CBS series Petticoat Junction from 1963 to 1964. Rick pursued a career in music from a young age. He’s had a popular blues band, and is still a successful singer and guitarist back in Canada. 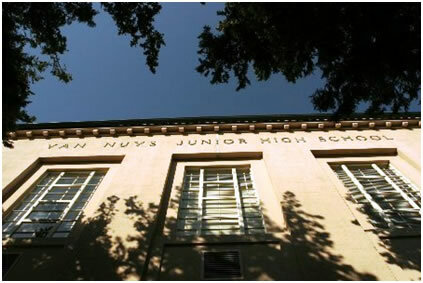 John went on to attend the newly-built Ulysses S. Grant High School in the Valley Glen neighborhood of Los Angeles, in the east-central San Fernando Valley. It is located adjacent to Los Angeles Valley College. 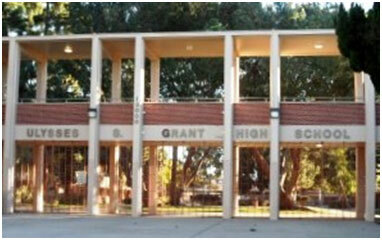 Grant High School has been recognized as among the best high schools in the country for its film and video productions made by students of the communications/technology magnet, but its reputation has seriously suffered in the last two decades, mostly due to shifting racial demographics and the tensions that followed. Since the mid-1960s, the high school has been utilized by many professional film and television productions as a filming location. It has been featured in film and TV productions such as Ferris Bueller, Malcolm in the Middle, Reba, Freaks and Geeks, Rena 911, CSI: Miami, My Name is Earl and many others. 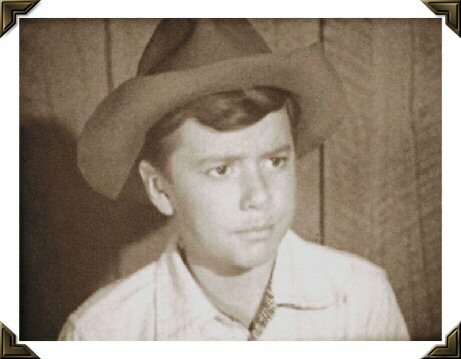 At the time that Johnny was attending Grant, Bobby Diamond, star of the equally popular boy-and-his-horse television series Fury also attended the school, as well as some other current and former child actors. Coincidently, both Johnny and Bobby ended up going to the California State University at Northridge at the same time as well. Johnny graduated from CSU Northridge with a B.A. degree in Drama and a Business minor. By then, his interests were leaning more toward live theater. In 1970, he moved from Los Angeles to New York City and began working in both New York and regional theater productions, and his family soon returned to Canada. John’s mother Dorothy was originally from England, and in the mid-1970’s John decided to go to London for two years to study the classics at the Royal Academy of Dramatic Art and the London Academy of Music and Dramatic Art. He also worked in theater productions in London, as well as in more television and films. A favorite role of his was that of Shylock in a London stage production of Merchant of Venice. 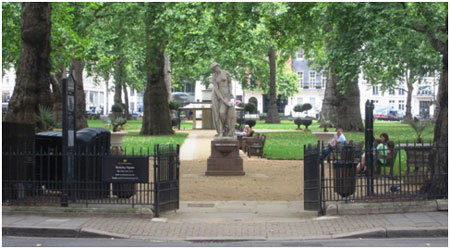 John's last motion picture, A Nightingale Sang in Berkeley Square, was released in 1979. 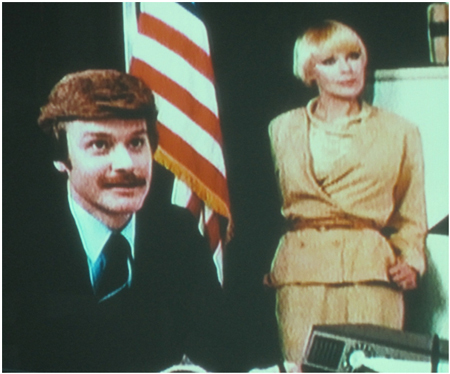 He played bank manager Blakestone in the British production directed by Richard Thomas. The film starred Richard Jordan, David Niven, and Elke Sommer. It's a light-hearted bank heist story that was filmed in and around the real Berkeley Square near the Mayfair section of London, with interiors shot at Twinkenham Studios. The film was David Niven's last film as well. The title for the film is the name of a British popular song--a standard that has been sung by Nat "King" Cole, Frank Sinatra, Bobby Darin, Rod Stewart, and many others. The film is really a delightful look at London in the '70s, and we recommend your seeing it if you get the chance. It was released on DVD in 1996 by Geneon Entertainment. John Washbrook hung up his cowboy hat and took off his boots long ago, but his series will always be remembered as one of the best-loved children-oriented series filmed during the Golden Age of the television Westerns. In 1976, John married his wife, Joy. In the mid-1980’s, he made the decision to end his long acting career entirely. He then began a very successful career in the banking business. John and Joy are still healthy and happy, and have been living in Massachusetts since 1988. They have a son, Luke, who was born in 1979. Click here to visit the Internet Movie Database (IMDb) to review Johnny Washbrook's Filmography data. The boy and the man—Johnny Washbrook today!